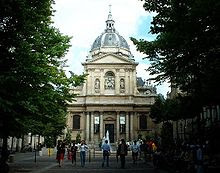 Paris-Sorbonne University is a public research university in Paris, France. The 1968 cultural revolution, commonly known as the French May, resulted in the division of the world's second oldest academic institution, the University of Paris, into thirteen autonomous universities. Paris-Sorbonne University is the inheritor of the former arts, languages and humanities faculties of the University of Paris. The University has twelve campuses in Paris, seven of them in the historic Latin Quarter, one in the Marais and two others respectively in Malesherbes and in Clignancourt. Paris-Sorbonne is composed of seventeen departments specializing in the arts, humanities and languages and enrolls about 14,000 undergraduate and 10,000 graduate students from France and around the world every year. Paris-Sorbonne also houses France's prestigious communication and journalism school, CELSA, located in the Parisian suburb of Neuilly-sur-Seine. Paris-Sorbonne is often referred to as the Sorbonne or La Sorbonne after the theological college (Collège de Sorbonne) founded in 1257 by Robert de Sorbon of the historic University of Paris. The historic University of Paris (French: Université de Paris) first appeared in the second half of the 12th century, but was reorganised in 1970 as 13 autonomous universities after the student protests of the French May. Following months of conflict between students and authorities at the University of Paris at Nanterre, the administration shut down that university on May 2, 1968. Students of the Sorbonne protested the closure and the threatened expulsion of several students at Nanterre on May 3, 1968. More than 20,000 students, teachers and supporters marched towards the Sorbonne, still sealed off by the police, who charged, wielding their batons, as soon as the marchers approached. While the crowd dispersed, some began to create barricades out of whatever was at hand, while others threw paving stones, forcing the police to retreat for a time. The police then responded with tear gas and charged the crowd again. Hundreds more students were arrested. With the fall of the French Fourth Republic after the tumultuous events of May 1968, the French Fifth Republic proposed various drastic reforms of the French university system. In 1971, the five ancient faculties of the former University of Paris were split and then re-formed into thirteen interdisciplinary universities by the Faure Law. 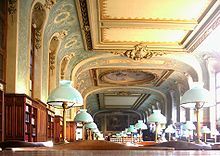 Three universities have kept the Sorbonne name as part of their official title: the University Paris-Sorbonne inheritor of the Arts and Humanities and the University of Paris III, which is located mainly in its Censier campus. The University of Paris 1 Pantheon-Sorbonne also wanted to keep Sorbonne for the international recognition. The Sorbonne premises also house part of the Paris Descartes University (inheritor of the Medicine department) and the Chancellery, the educational authority of Paris. Since its establishment following the university reforms, Paris-Sorbonne has been governed by five presidents; the founding president, historian Alphonse Dupront, was succeeded by the philosopher Raymond Polin, who was followed by hellinist Jacques Bompaire. Next came religious historian Michel Meslin and subsequently Jean-Pierre Poussou, a historian of the urban and contemporary world. In May 1998, Georges Molinie, a specialist in modern French stylistics, was elected. He was replaced by geographer Jean-Robert Pitte in 2003. Following the University's elections in March 2008, Georges Molinié was re-elected President of Paris-Sorbonne.